Description: Goddess of domestic health, happiness and prosperity; She Who is a flesh-eating raksasi with the power to assume any form; Protectress from calamity; Night-eater of corpses left at cross-roads; Personification of old age; She Who is sometimes presented as long-nosed and sagging lipped, with long and pendulous breasts. To Whom are sacred: cross-roads. Icon: pictures of Her as a young woman surrounded by children painted or carved on a house wall. She is propitiated as Grhadevi, Goddess-of-the-Household. She bears a resemblance to Hariti, below. Description: Guardian Devi of a new home. 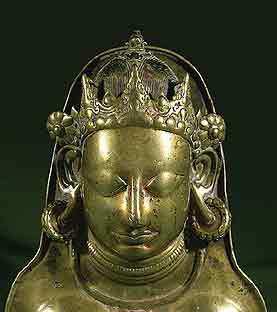 Perhaps also called Svasti-Devi, below. Geography/Culture: Hindustani and Pakistan: Pre-Vedic Dravidian. An image found in Taxila. Tutelary Goddess of Rajagrha. Adopted and reformed by Buddhism. Linguistic note: See Har, linguistic notes, under Kilili-Mushritu. Description: Under Buddhism She became Protectress of children. Herself a Yaksini, (qv Gramadevata), and Mother of Yaksinis. Jara bears a resemblance to Her. Jyestha has many affinities with Her. Origin of Japanese Kishimo-Jin, qv. Sources: Brannigan AA 168 (and image); Stutley HDH 126, 130, 346. Description: Goddess of protection and prosperity for the family and its home. worked on: June, December 1990; August 1991; dDJune 1995.